I got married in Italy and the first place we went was Venice! What a romantic place! We will have stories to tell the rest of our lives. You might say that I painted this with so much love in my heart and I would nothing better than to make your vacation memories live on forever. 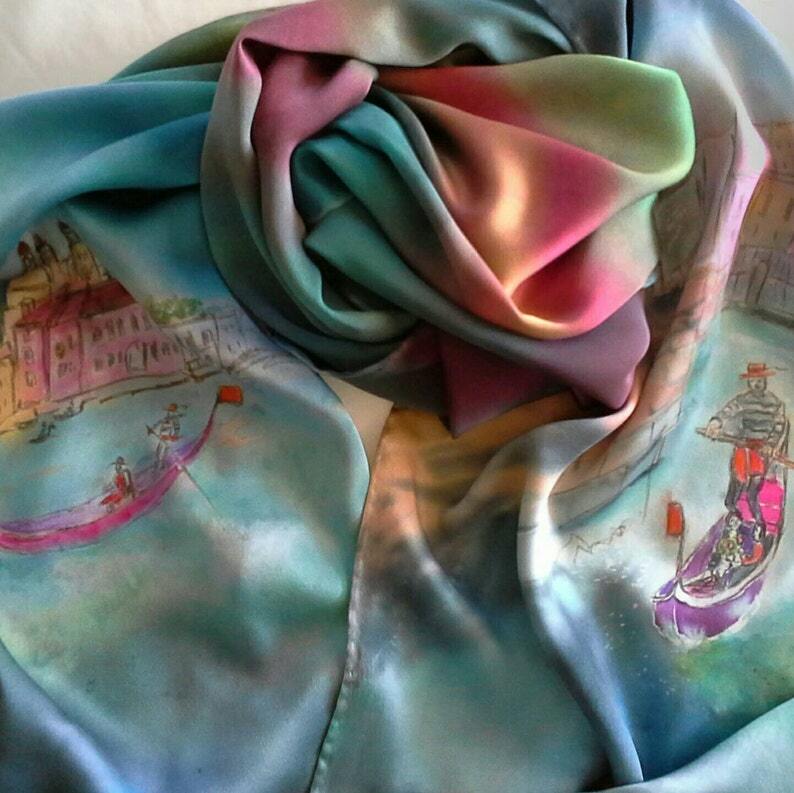 Hand Painted, Wearable Art Scarves are perfect gifts because they fit everyone, can update your wardrobe in a heartbeat and a great conversation piece. You will be noticed! Every piece I create is never the same due to the nature of the hand painting process. I might be inspired by others but I create my own work. I do not know what I’m going to paint until I put the first brush stroke down. I like mixing mediums with stamping or blending values of color on top of one another which creates depth on my hand painted pieces. I can customize a scarf in your colors, size and fabric. CARE INSTRUCTIONS: I will send you instructions with each order. Easy to take care of: Hand Wash in Lukewarm to Cool Water, Press on backside when wet and you are ready to go all over again. Please see further wash instructions in shop policies. Thanks for visiting my shop and I'd be thrilled if you find something you love. Please share my shop on Pinterest, Twitter and Facebook~!